Top 5 Things To Do In Amaury Rivière Du Rempart Flacq To Make Your Visit Exciting! Amaury is one of the big towns in Mauritius where tourists like to flee on their holiday. It is located in the largest district of Mauritius, Riviere du Rempart in the northwest part of the island. One thing you don’t know about this town is that while the northern part of the town comes under Riviere du Rempart district, the southern part of the town comes under Flacq district. Bot these districts are two of the happening districts of Mauritius. You will find plenty of things to do and explore here. Mauritius is one hell of a destination to have an amazing tropical experience. 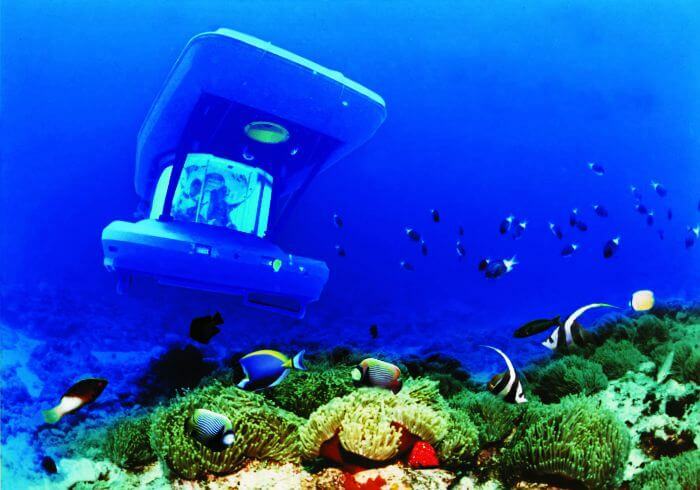 If you want to indulge in watersports, then there is no better place than Mauritius to enjoy scintillating underwater beauty. 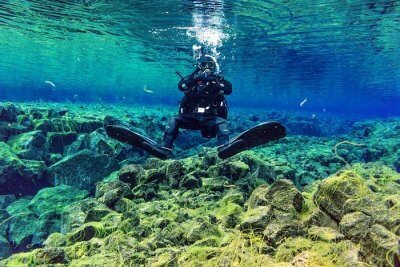 You can go snorkeling, scuba diving, and sea walking in the ocean. If you are not in a mood for this, you can just lie on its white sandy beaches and take a sunbath. Do not forget to put sunscreen to avoid the harmful effects of UV sun rays. You are lucky to be in Mauritius as there are innumerable islands and beaches on this island. 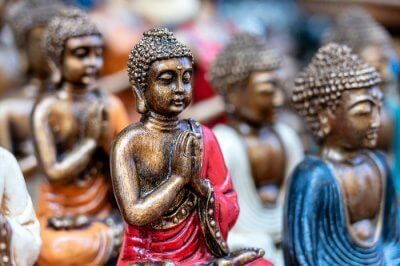 Here are the top 5 things and activities you should not miss while you are on your vacation in this part of the island. Make the best of your time with these fun activities. The Mauritian land offers a unique mix of Creole, African, Indian and Chinese influences. Make sure you experience both: street food as well as a romantic fine dinner. If you have not tried local Mauritian cuisine on your holiday, have you even been to this place. Seafood lovers are going to love this place as you get plenty of fresh seafood to enjoy. Catch fresh fish from the ocean and then have it for your dinner in the evening. While you are at it, try crab, squid, and mini-octopus too if you have a strong appetite, more than that s strong heart. 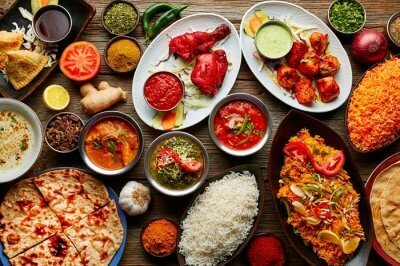 Mauritius is heaven for nonvegetarians. There are a lot of options for vegetarians too. You can also try fresh tropical fruits that you won’t find anywhere else. The must-try from the Mauritian streets is dholl puri served with hot chili paste. The best places to try these are at Dewa & Sons on Rose Hill and Chapeau La Paille in Port Louis. 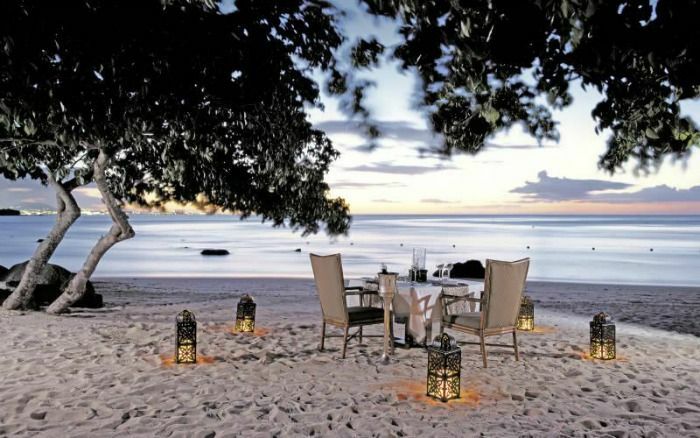 On the other hand, some of the top Mauritius hotels and resorts like Oberoi offer in the house set up to enjoy a private romantic dinner with your loved one. This saves you the effort of stepping out to look for a romantic reservation. Parasailing in Mauritius is a great sport to start with. It does not just give you a birds-eye view of the lagoons, but also an unmatched thrill. This is the best place to lose yourself in the magnificent turquoise waters and their vastness. 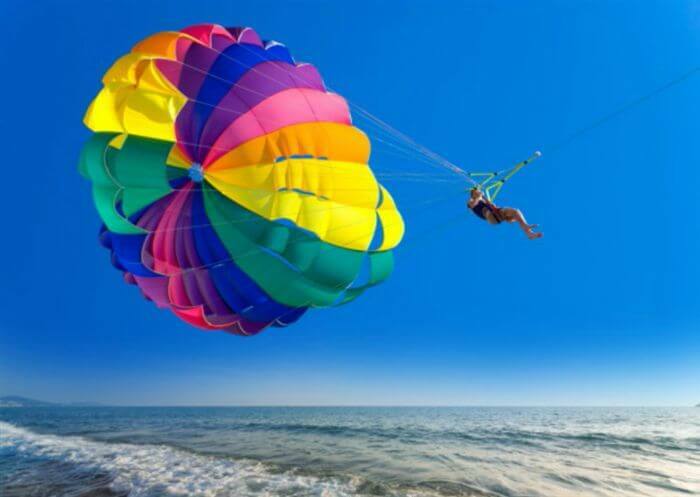 The duration differs from place to place, but basically, a parasailing flight is about 5 to 15 minutes. Parasailing is a thrilling sport but make sure you double check your safety gears and harnesses before taking off. If you like flying, then you are going to love this watersport. Also, you do not need prior expertise to do this activity. All you have to do is get yourself tied to a tandem, stay calm, and enjoy while you are in the air. The views you will get from the top are truly amazing! There are a lot of places near Amaury where you can enjoy parasailing. 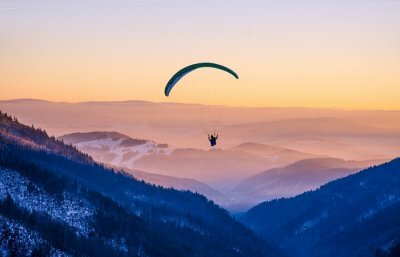 Make sure you go along with a trusted adventure activity organizer who use proper gear and equipment and even holds a certificate to conduct adventure activities. 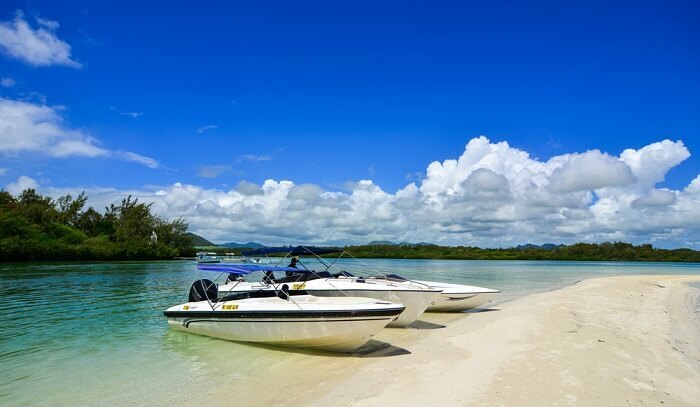 A rather easy one among various water sports holiday in Mauritius, kayaking allows you to explore mysterious islands and caves. 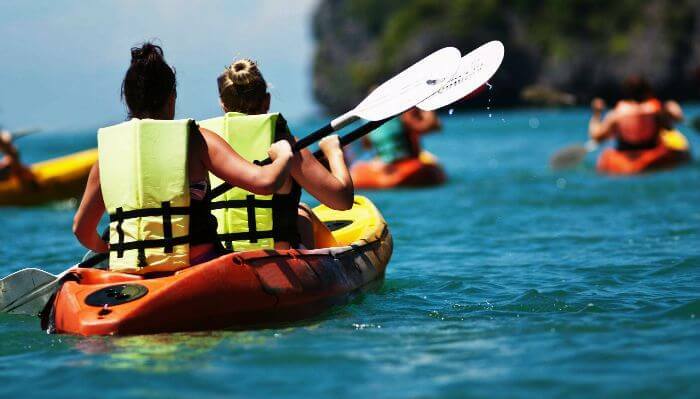 You can opt for a single kayak or a double kayak. The best part is that you can discover a lot more on your own. If starting from Pointe Aux Sable, paddle through the water and discover the gorgeous basalt rock gardens while entering in the stunning rock caves. You will be left spellbound with the beautiful sights you witness on this journey. This is something new that you won’t get at many places to enjoy. Mauritius is truly amazing. The hills and cliffs here have hidden caves which lure tourists and adventurists for some exploration. Where: The Cliffs of Albion in the Mauritius West Coast; starting point is Pointe Aux Sable. Tips: Pack extra pair of clothes, sunscreen, towels and comfortable sandals. You can also opt for Cave Sea Kayaking classes. Yemaya Adventures offers various courses. Read More: 12 Best Beaches In Mauritius For Your Next Reviving Holiday In 2019! Even though it is an average size island, Mauritius is surprisingly vast. Just at a stretch of a few kilometers, you will find something new. Even a whole week of vacation in Mauritius is not enough to fully explore this island. 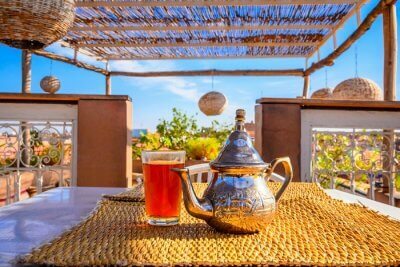 Yet, these are some things to do in Amaury Rivier du Rampart Flacq that you should not miss out on if you happen to be in this part of the island. Whether you are on your honeymoon or family vacation, Mauritius makes an ideal destination for all kinds of holidays. This island country wins everyone’s hearts.